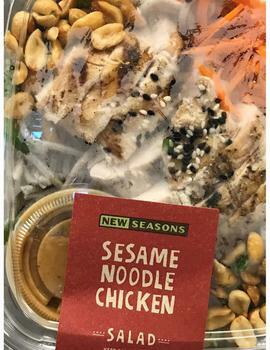 New Seasons Market of Portland, Ore., is recalling an undetermined amount of ready-to-eat sesame noodle chicken salad. 24-oz clear clamshell plastic containers with “NEW SEASONS SESAME NOODLE CHICKEN SALAD,” with a “BEST BY” date of “07/18/2018” on the label. The company operates a kitchen exempt from USDA inspection and the products produced there do not bear a USDA establishment number on the packaging. The recalled product was shipped to retail locations in Oregon and Washington. Customers who purchased the recalled should not consume it, but discard it or return it to the place of purchase. Consumers with questions about the recall may email New Seasons Market at talktous@newseasonsmarket.com.